In the grand scheme of pop culture, Morrissey and The Smiths are undoubtedly influential, but still questionably household names at this point. That makes the appeal of England Is Mine a shaky proposition: It’s a biopic that ends before its subject’s life-changing work even really begins, so those without the knowledge to fill in the gaps will almost certainly leave wondering why they should care. Director Mark Gill, who grew up in the very same Manchester neighborhood as Morrissey, paints a romantic picture of a sullen teen whose life, while drab, doesn’t really explain his shyness or depression. And his film ends just as Morrissey, the singer and lyricist behind The Smiths, meets Johnny Marr, whom fans will know constitutes the other half of a once-in-a-lifetime musical partnership. Whether that conversation actually took place is unlikely: Morrissey himself, who’s famously critical and litigious about anything said publicly about him, had nothing to do with England Is Mine. All of the internal monologues that Morrissey, the character, delivers are fiction—though Gill and his co-writer, William Thacker, do an admirable job of capturing the spirit of his wit. It doesn’t hurt that Jack Lowden (seen in this summer’s Dunkirk) nicely nails Morrissey’s voice and tone of fatigued self-doubt and condescension. That said, there’s really nothing here for the real-life Morrissey to dislike anyway. England Is Mine makes Morrissey out to be a reluctant hero—a genius who’s destined for stardom, if only someone would push him hard enough out of his book- and music-filled Manchester bedroom. 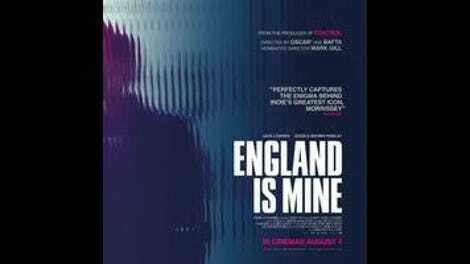 His friends eventually do, but England Is Mine leaves the much more interesting place that he landed thoroughly unexplored. And that makes the movie, while potentially interesting to others and reasonably nice to look at, likely something that fans and fans only will find essential.